The clackety-clack of freight trains running through town has long been part of the charm of little towns like Haverstraw, N.Y. But in recent months, news that these old cars are carrying a new type of oil is giving residents an ominous feeling about their local railroads. "What if one had a problem with one of the wheels, it tipped?" said resident Dennis Herlihy, who lives downhill from the tracks. The I-Team obtained railroad maps which show some of the routes crude oil trains take as they travel through New Jersey and New York. The maps show places as small as Haverstraw and as big as Newark are along the routes. The oil, which comes from the Bakken region in North Dakota, is part of a recent boom that has kept gas prices low and made the U.S. less dependent on the Middle East. But the oil has come faster than the pipelines and other infrastructure can handle, and the National Transportation Safety Board has warned the DOT-111 tank cars, the most common type of car used to transport the oil, could be hazardous because their shells are too thin. "We’re told it’s much more volatile, much more explosive, much more corrosive to the cars themselves," says Haverstraw Mayor Michael Kohut. Kohut, who also is a volunteer firefighter, says local emergency workers are not informed about what materials are passing through, or when they come by. He worries about not having sufficient evacuation routes in the event of a disaster. “Trying to get 11,000 people out of two exits would be an impossibility," he said. In other places, tank car accidents have already been catastrophic. Last year, 47 people died in Lac-Megantic, Canada when DOT-111 cars carrying Bakken crude derailed, creating a river of fire through downtown. The railroads say 99.9 percent of all hazardous materials moved by rail arrive safely. But they, too, are asking tank cars be built to a higher standard and that existing cars be retrofitted. That puts the problem in the laps of the oil companies, which own or lease the tank cars. They say 40 percent of those cars exceed federal standards, but they are not ready to replace or retrofit the other 60 percent right away, which some estimate would cost more than $1 billion. “The cost is only one part of the equation. We want to make sure, as we squeeze out that last bit of risk, that we do it thoughtfully so we don’t create risk elsewhere, so we truly get to zero incidents,” says the American Petroleum Institute’s Jack Gerard. API also says oil companies are willing to work with local first responders to better train for derailment response. As a precaution, railroads will keep large crude oil trains under 40 mph in and around major metropolitan areas starting in July. Sen. Chuck Schumer says he wants DOT-111 tank cars to be replaced. "We need the Department of Transportation to require it, and require it quickly," said Schumer. So far, an accident of the magnitude of the one in Lac-Megantic has not happened in the U.S., but Rockland County recently got a wakeup call when a train crashed into a car transporter in West Nyack right over Rockland County’s water source. 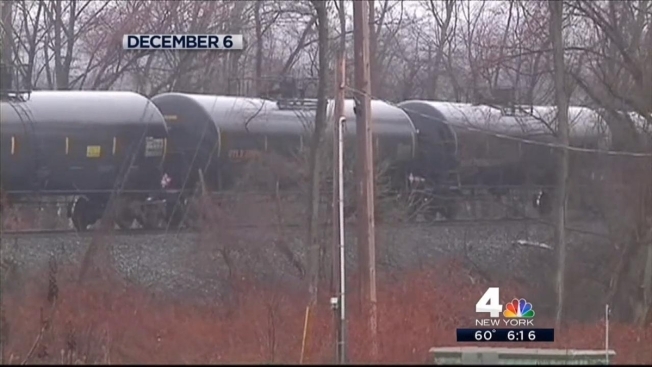 That crude oil train was empty, but authorities worry what would have happened if it were full. “Water system in Rockland County into Bergen County would have been contaminated,” says Rockland County Sheriff Lou Falco. The Department of Transportation is reviewing industry comments about the DOT-111s and hopes to finalize a new rule on those cars in 2015.